This winter has achieved the all-time record for most classes cancelled/rescheduled. Hands down. After last Sunday's storm, I took the following pictures. First, the view from inside my sewing room looking out. 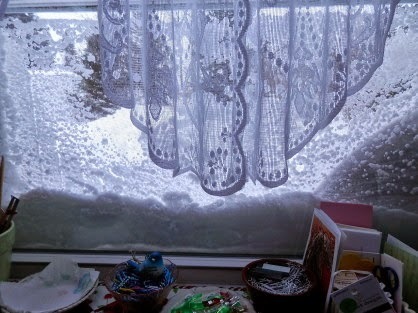 That is snow accumulated between the window and the screen, with a backdrop of the giant snowdrift. 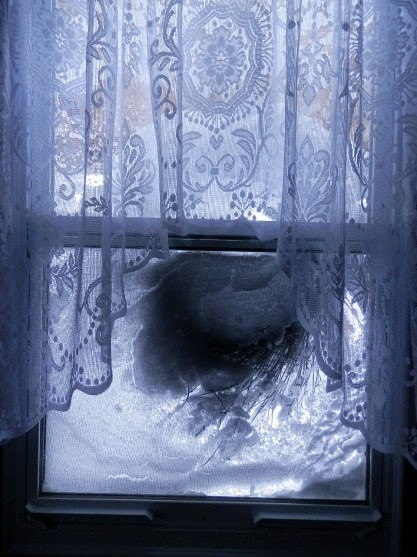 From inside the mud room, looking out. 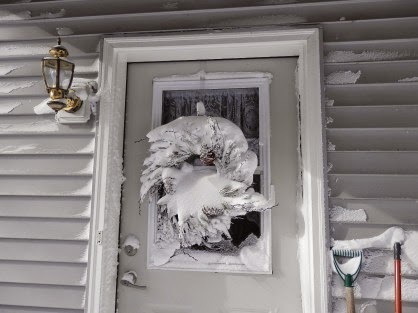 The darker area in the middle is my wreath, filled with snow! And more snow sticking to the screen. Looking out the front door. 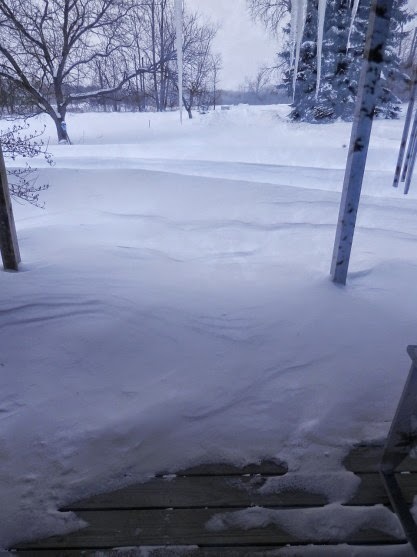 There is actually a step and part of the driveway before the first "wave" beyond the posts, which are on the edge of the porch. And the door wreath from the outside. Who would have thought that we would think above 20 degrees would feel like a tropical heat wave? And the wind not blowing is quite a stroke of good luck. I know others are having a horrible time with the snow--we all seem to be in the same boat. I am thankful that I am warm and safe, and that is what I wish for everyone. P.S. I am listening to Betrayed by Lisa Scottoline and just finished reading Saving Simon by Jon Katz. Both are excellent! 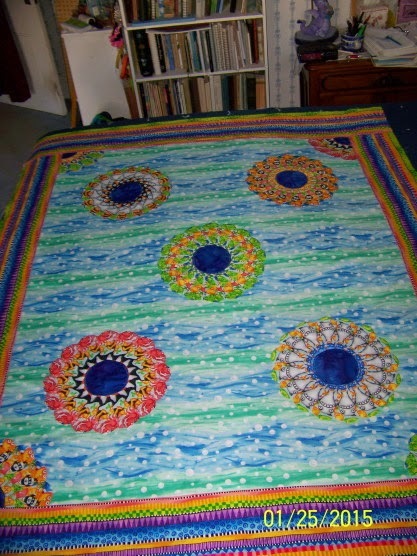 Noreen recently emailed me that she had completed a fussy-cut Dresden Plate quilt. I, of course, wanted to see! 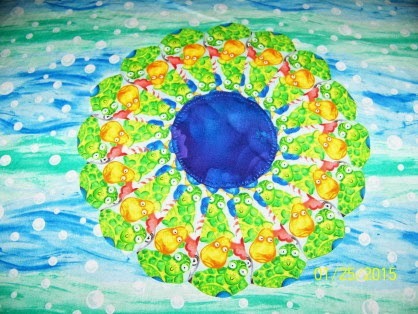 Here's a picture of the whole quilt. LOVE how bright and colorful it is! A close-up of one block. And of another! 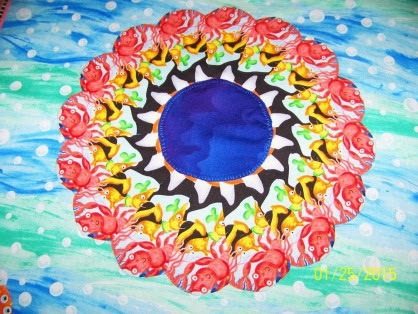 Isn't the background fabric just perfect for this piece? I first met Noreen at the Vermont Quilt Festival last year and featured a picture of her red and white quilt here. Another great job, Noreen! Thanks so much for sharing! P.S. I am listening to The Escape by David Baldacci.